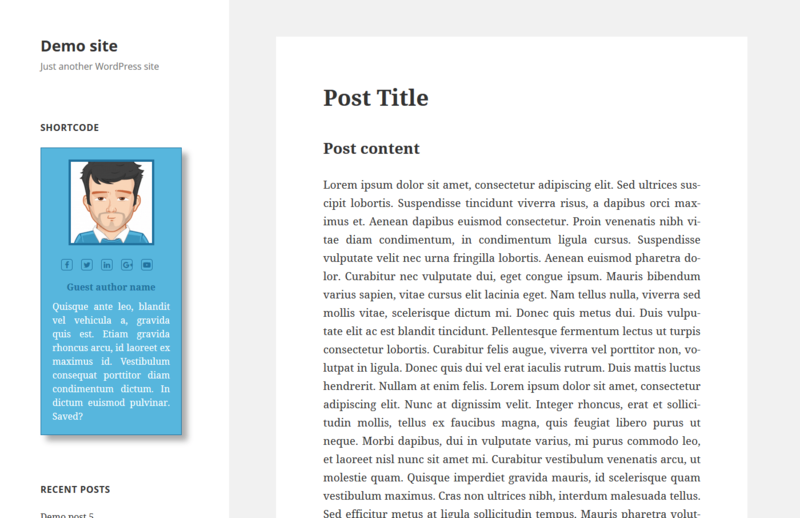 Displaying a Molongui Author Box anywhere in your site is possible thanks to the use of shortcodes. And your sidebar is no exception. If you want to add an author box on your sidebar widget, Molongui Authorship gives you the ability to display certain authors or the current post author info on your sidebar. Molongui Authorship is smart responsive and will display beautifully on any sidebar sizes. Only if you are running WordPress version < 4.9, go to Settings > Molongui Authorship > Advanced and set the “Enable in text widgets” option to “Yes”, under the “Shortcodes” section. Save changes. Choose the Widget Area to place the author box and add a “Text” widget. Place the shortcode in the “Content” field. Check this article to know how the shortcode should look like.